After World War II there was a return to normal life, and normal life included new cars. The average car was nine years old by 1946 and well past worn out, with the average service life of cars being about 5 to 7 years in this era. 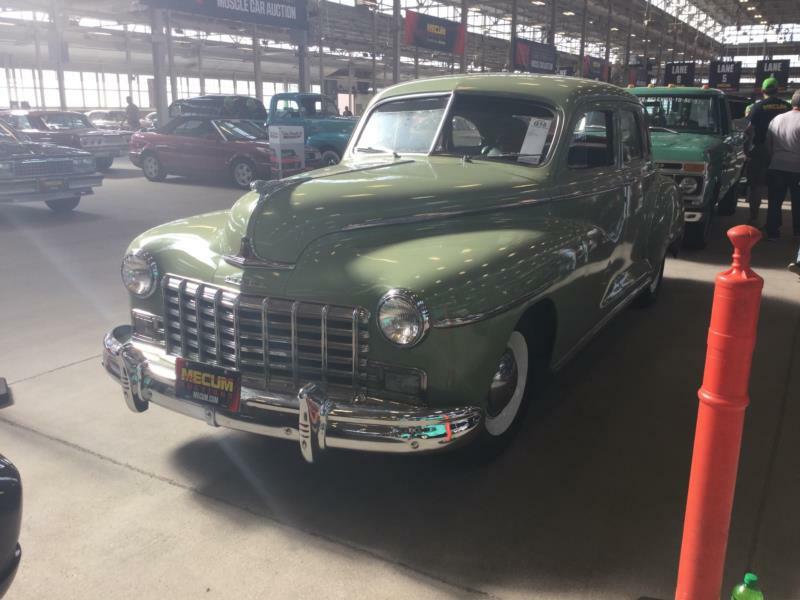 Like other companies, Chrysler’s Dodge Division was forbidden from working on postwar car designs during hostilities, so the 1946 cars were virtually the same as 1942 cars, with very few changes. The same flathead 230 cid six powered them, losing 3 horsepower (down to 102) compared to 1942. The higher priced Dodge Custom four-door traditionally had been the best seller and this carried over for 1946 with a retail price starting at $1,389. Dodge had no embarrassment in the sales leagues, with a decent fourth place ahead of Buick, Pontiac and Oldsmobile and behind Ford, Chevrolet and their own brother division Plymouth in third place. Dodge Customs were sold in club coupe, convertible coupe, aforementioned sedan, town sedan and long-wheelbase seven-passenger sedan. Larger families liked the extra room possible on these cars, as did some taxi operators. The 1947 cars were essentially unchanged because there was not much point in trying to change a car they could scarcely produce enough of as it was. Every car offered up to the public was eagerly snapped up, demand was just that high. With the seller’s market still going as it had before, most dealers accessorized the cars to the max (and generously padded the mark-up). Some unscrupulous dealers sold themselves the cars, drove them a few weeks then sold them on at very inflated prices as “used cars” since car prices were technically still held down by government mandate. Shortages of everything possible, inflation, strikes both large and small, even riots began to erupt across the nation and despite that, Dodge managed to churn out more cars in 1947 than 1946 with an estimated 243,000 cars (about 50 percent more than 1946). The 1948 and very early 1949 Dodge Customs were again essentially unchanged. The biggest difference once again was higher prices, with the seven-passenger sedan going up from $1,861 in 1947 to $2,179 in 1948. Oddly, there was no price increase for the very early, unchanged 1949 cars.